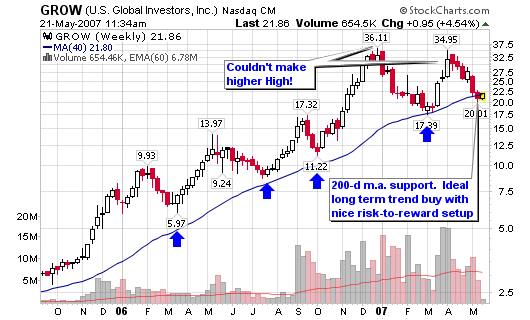 This stock has held the 200-d moving average for several years and is currently trading on the line with an ideal risk-to-reward setup for longer term trend buyers. Institutional sponsorship looks to be slipping based on the lower volume figures on the chart and the actual reporting numbers listed below. However, the company has had impressive earnings and revenue growth over the past several years while exceeding the average for its industry. The company does not have debt therefore it sports a debt-to-equity ratio of zero which is excellent for investors. My largest concern with this stock is the state of the overall economy and the effects of the housing slow-down. A major violation of the 200-d m.a. on heavy volume will be a red flag to sell your position or avoid taking a new position. See the breakdown for the potential trade setup below. Accolade Funds, which manage 13 no-load mutual funds with various investment objectives. Target of $29+ based on previous action, Fibonacci levels and current location of 50-d m.a. Risk to reward has a potential of 4-to-1 based on exact entry and stop. great coverage as usual. Thanks for posting the example trade setup as well, this helps a lot for people wanting to paper trade it to learn, or possibly take a live position. Great analysis, Chris. You convinced me that I need to add the MA 200 back to my charts. I’ll be watching GROW for a possible entry as well. Thank you and I must say that the 200-d m.a. has been my best-friend this year. Jim, Keep in mind that things can and do change so don’t use the strategy during every cycle. However, it works 75% of the time (strong bear markets crush this strategy). But, it gives you a place to short sell weak stocks breaking the line in huge volume with failed attempts to recover. Hi Chris, thanks for your post. I have questions about the setup trade in this example. 1. What is your target entry price – is it Monday’s intra-day price 21.86, or Tuesday’s market? (It wasn’t clear to me.) Or would you wait for an upward trend confirmation before going long on this stock? 2. Also, since the volume seems to be drying up, will you be waiting for higher volumes too before moving into a position? I was at an investment conference and the guy that runs GROW was a speaker there. He is awesome. The target entry is at or near the 200-day moving average (it can vary slightly). The closer, the better! I would like to see volume increase near this accumulation area. It is okay to accumulate but I will not add further shares unless volume confirms the possible move. I really appreciate this blog and have been a subscriber to the MSW website until you closed it – yes, even in Good old Germany Chris Perruna is well known by now ;o) I hope everyone will therfore ignore any mistakes in these lines. I have learned a lot of things studying Livermore, Van Tharp, Schwager, IBD and this blog (the expextancy calculator – great thing). My conclusion: Finding a trading style that really fits one’s personality together with sound money management will bring financial and emotional success over time. 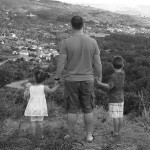 This is what I believe, this is what drives me to go hunting and to take risks. Back to GROW: According to my method I would still wait before buying shares. I use a very similar approach as you to screen for fundamentally sane stocks – e.g. the IBD approach. But unlike you and IBD I like to buy the lion share of any stock when I see long-term-momentum coming into the stock. For this purpose I use weekly MACD in some specific combinations and I buy when MACD crosses its signal line, preferably when it’s under zero. Normally this comes after a setback to the 200-MA and before the breakout buy recommended by IBD. Until now GROW doesn’t fulfill my requirement but it’s setting up to. I think in 1 to 3 weeks GROW is ripe for buying using my approach. By then I suppose I will have to pay 24 to 26 $, my stop will be below 20. So what? If you want to have big fish you have to give it rope. Looking forward to any comment. It’s great to be in touch with people striving to improve. That is excellent insight into your methods and I encourage you to write more often when you see something like this. I have never really used the MACD but I can locate what you are talking about. p.s. – your writing is fine, don’t sweat it! I’d love to do that. May I load up a chart picture to explain what I mean? And if yes, can you show me how to do that? I still don’t have experience in working on blogs. – Is the broad market in an uptrend/rallye? I check if NAHL is positive, if there is a rallye according to IBD and how far the indexes are extended from their mid-term-value (50-Day-EMA). – Only buy the best stocks! I use the MSN stock screener which is free of charge. My criteria are: EPS growth qtr vs qtr > 25%; EPS growth year vs year > 25%; Revenue growth qtr vs qtr > 25%; Revenue growth year vs year > 25%; Return on equity > 17%; stock price > 15$; average daily volume > 150.000 shares AND price must be at least at 80 % of its 52-week-high. With this selection I know I buy only good stuff which is setting up to reach news highs. This is my weekly routine on Saturdays. Today I got a list of nearly 100 stocks. Then I check their weekly charts. – First question: Is the selected stock in an uptrend? That means for me: Is the trend of its 10-week-EMA at least neutral or positive? I consider only those stocks as potential buy candidates. – I have three timing methods to enter a selected stock. I look at volume with every method. a) Weekly MACD: This indicator was developed by Gerald Appel and I use it the way he explains it in his book “Technical Analysis – Power tools for active investors” ( I encourage everyone to read this book, it is full of clear thinking and practical advice). MACD (Moving Average Convergence Divergence) is created by subtracting a longer-term exponential moving average (I use 19 weeks) from a shorter-term exponential moving average (I use 6 weeks). The signal line is a 9-week-exponential moving average of this difference. I buy when MACD is crossing its signal line – so I get in when the crowd is becoming incraesingly bullish about a stock. One very good example is ICE. This stock is behaving perfectly in the sense of CANSLIM and is now setting up according to my MACD-method. Just check on stockcharts.com. When you use a weekly chart and change the conventional settings of 26 /12 /9 into 6/19/9, you will see that MACD is just crossing its signal line. Look back to the week of 1st of September 2006 where weekly MACD crossed ist signal line too. This way you could have entered the stock five weeks before the Canslim entry at about 64 $. I would have placed my stop below the latest weekly low which was at 51,77 $ and buy the amount of shares my money management allows me to. Just two weeks ago I entered RIMM with this method at about 145 $. By the way: I think RIMM and ICE will prove to be big winners in the next months. b) Canslim entry: If I don’t get a stock with the MACD method I can buy it according to O’Neil’s methods – cup with handle, double bottom etc. Sometimes in a big uptrend MACD entry and Canslim entries fall (nearly) together. c) consolidation at the 50-day-EMA: This too is a method shown by O’Neil. 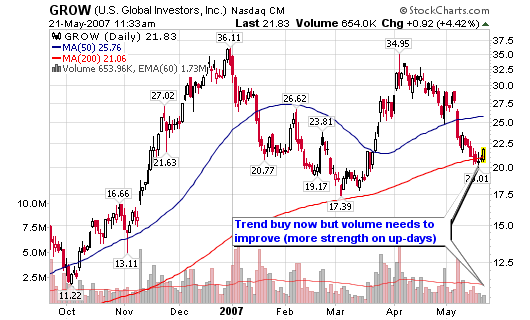 But I like to add shares or by the stock as soon as possible after it rebounds with volume from the moving average. Perhaps LFC is a good example as it rebounded on May 24th. Well, this are my stock selection and entry methods. But even more critical is how to manage the trade, how to trail stops and when to get out finally.